Hamilton Quartz Desk Clock Made In Germany . Condition is Used. Shipped with USPS Priority Mail. Vintage Hamilton Greenfield Manor Mantle Clock-Con Edison Retirement Gift. Condition is Used. Keeps good time. There is an engraved plaque on top signifying it as a retirement gift from Con Edison in NY. There are some scratches on case -see photos. Uses one AA battery-not included. Vintage Hamilton Mantle Clock - Key Wind 5 Hammer 2 Jewel West Germany Movement. Condition is Used. Shipped with USPS Priority Mail. See pictures for any scuffs or scratches or Knicks please. Also when I put the key in I can’t get it to turn. I’m not getting the clock to tell time. Any help with it let me know please. I put a battery in and it works fine. Wood is in excellent condition. Very sturdy and well built. Hamilton Westminster Mahogany Wood Tambour Camel Back Mantle Clock Germany Works. Condition is Used, there is some wear to the clock please view all photos!!! Shipped with USPS Priority Mail. 1 of the gimbals is in its original wrapper with the original label. Up for sale is a Hamilton battery operator clock. Clock was made in Germany and in good condition.If you have any questions about this item please leave me a message thank you and have a great day. Please take a second to look at my e-Bay for other great items thank you. 8 Day westminster chime wall clock Hamilton 25 years GM employee . Condition is Used. Shipped with USPS Priority Mail. Working with key. 25 years truck and bus group GM corporation. This will be packed and packaged carefully and purposefully with a promise of safe delivery-taking no chances. This clock dates 1990 and just monior signs of wear...a little scratch under class. Othere than that, a beautiful edition to any finely decorated and designed room. Marble may look like it has cracks, but its just the veins in the stone. Clock ran less than 1 minute slow over 6 hrs. Plug and cord is not the original I believe, see pic. We put a battery into this piece and it started right up and ran well for the roughly 30 minutes we observed it. Wooden body is in fantastic condition showing only the lightest of age appropriate wear around the edges and corners. MADE IN WEST GERMANY. Works great! THE WOODEN CLOCK CASING IS IN VERY GOOD CONDITION SHOWING ONLY VERY LIGHT AND MINIMAL SIGNS OF AGING. 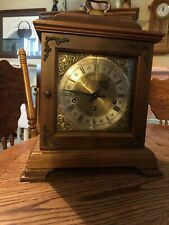 ANTIQUE HAMILTON MANTLE CLOCK. Hi This is a god quality Hamilton clock and weather station the clock case is solid brass. This clock is 71/2 wise 2 deep and 4 high and weighs 4 1/2 lb. This clock shows a little of its age. Take a good look This clock is in very good condition and worthy of any desk or collection. Have a used clock here for your computer, bedroom or living room table. Clock works great and runs on a single AA battery. The color is Goldtone. The clock is untested and sold as is. Looks to be in good condition. Vintage Hamilton chime table shelf clock with silent chime switch made in West Germany . Condition is used but in excellent condition and everything works! Shipped with USPS Priority Mail. Stunningly beautiful clock. Condition is Used. THIS MODEL WAS ONE OF THE ONES MADE IN JAPAN. I HAVE TRIED TO CAPTURE THAT ISSUE IN PIC #12 (LAST PICTURE) ABOVE. I SPOKE WITH BARRY AT CHRONO ART CLOCKS IN COTATI CALIFORNIA WHO IS AN EXPERT ON REPAIR AND RESTORATION. Impressive Solid Brass Quartz Hamilton Floating Table Clock in good condition works as designed. Works great. 9 " at the base. Hamilton Sangamo Synchronous Motor Clock Style S-406. It was made in Lancaster, PA and Springfield, ILL and only produced for about 8 months. Start lever in the rear of the clock.The clock runs "sold as is" due to age. Not sure what is wrong. Has a small plaque on the face. Shelf H - AO. We have been giving quality service to the on-line collector community for over 19 years. The tone is outstanding in sound quality using the beautiful solid walnut hardwood case for nice resonance. This is a beautiful clock that will look great in most settings! Came from an Estate Sale. It originally belonged to Judge Fineman , who was a Speaker of the House for Pennsylvania. Other items will be posted later. Clock may need tuning and cleaning! Hamilton Quartz Carriage Desk Clock West Germany. Condition is Used. Check all pics thank you. Shipped with USPS Priority Mail. Missing the bottom feet. Exterior shows wear and tear. CA, FL, HI, IN, NJ, PA, SC, TN. Has fake clock barrel winds. Clock has also the original gong in place. The clock case is super clean. Clock been tested for a week. Works well. It is a GIANT sized with an alarm clock look. It is Mickey Mouse. It is not a real alarm clock. There is the hanger to attach to a wall. The clock hands have a little red color rubbed off, and a wavy look to the hands. Beautiful Hamilton Grandfather Clock - . Condition is Used. The clock is 74 inches tall. The item is the clock case, moon dial with Hamilton in it,a dismantled movement including chains and hands. There are NO WEIGHTS AND NO PENDULUM and NO BACK PIECE FOR BEHIND THE MOVEMENT. This is pick up only and sold as is. Please refer to all pictures for details. Ask questions. Vintage Hamilton Clock, Barometer & Temperature readings in wooden desktop cabinet with gold hinges. Two doors, sitting on wood pedestal. Glass front, AA battery, works great! Small nick on front upper corner and some wear on wood top edge - can be touched up (see photos). 6 3/4” tall, 6” long, 2 3/4” deep. You will love this! A HARD TO FINE HAMILTON DECK CHRONOMETER MODEL 22, ESPECIALLY WITH INNER AND OUTER WOODEN BOXES. THE SMALLER BOX WITH GIMBELLD APPARATUS TO HOLD THE MOVEMENT MEASURES 6X6X6 INCHES. IT FITS INTO A LARGER PADDED BOX WHICH MEASURE 8 1/4 X 8 1/4 X 7 3/4 AND HAS A BASE BOARD A BIT LARGER. BOTH BOXES MARKED HAMITLON WATCH CO LANCASTER, PA USA. Has been running for the past few hours without issue. Not sure what is wrong. Shelf H - AE. We have been giving quality service to the on-line collector community for over 19 years. Just look at all pics! Good Luck! GREAT DEAL! The clock does run and strike. The hands match and look appropriate to the clock. The clock was an anniversary piece given to an employee of DuPont. DuPont is embossed on the face of the clock. Nice looking bracket clock for you here.